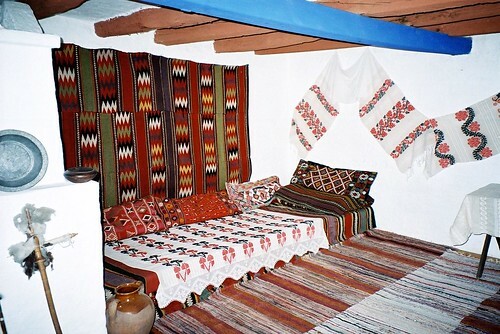 The use of woven textiles in peasant interiors is so beautiful. The level of pride in the textiles is so evident, and that’s no doubt the result of the intimate connection people would have had not only with knowledge of the work and artistry involved, but also with the plants and animals from which the fibres came. These interiors are in Hungary (top) and Romania (two below), and they were found by just searching for “peasant house” on flickr. 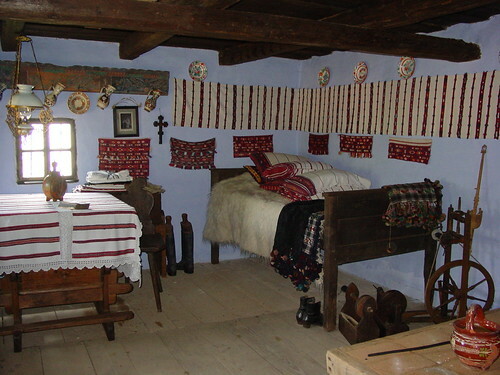 It’s a sad fact that most often when you find images of peasant interiors, they’re in folk museums. That goes for all of these photos. The photo below makes me want to hang a runner along the wall, and the seating platform in the Romanian room at bottom is great, the way it is covered in rugs and pillows. This entry was posted on Wednesday, February 4th, 2009 at 2:39 am	and is filed under design. You can follow any responses to this entry through the RSS 2.0 feed. You can leave a response, or trackback from your own site.